Pitchburst is a unique, fun new water game for parties, fund raisers, as well as corporate, holiday and other special events. 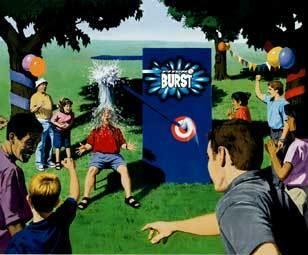 Pitch a ball, hit the target and SPLURSH!, a gallon-sized water balloon bursts over a participant's head! The game is so safe (nobody falls into water; it falls on them! ), that anyone can play. It can even be used indoors with smaller balloons and just as much fun. Add one to your next event.